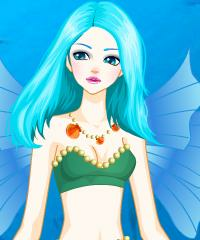 Fantasy Dress Up Game. This lovely heroine creature is both mermaid and a fairy. She can live underwater and as well fly whereever she wants to go. She sometimes flies to Neverland to visit Peter Pan and Tinkerbell. After you have played this game you can play our popular Disney Heroine Creator Dress Up Game. In that game you can create Tinkerbell and many other Disney characters. Go Play & Have Fun.